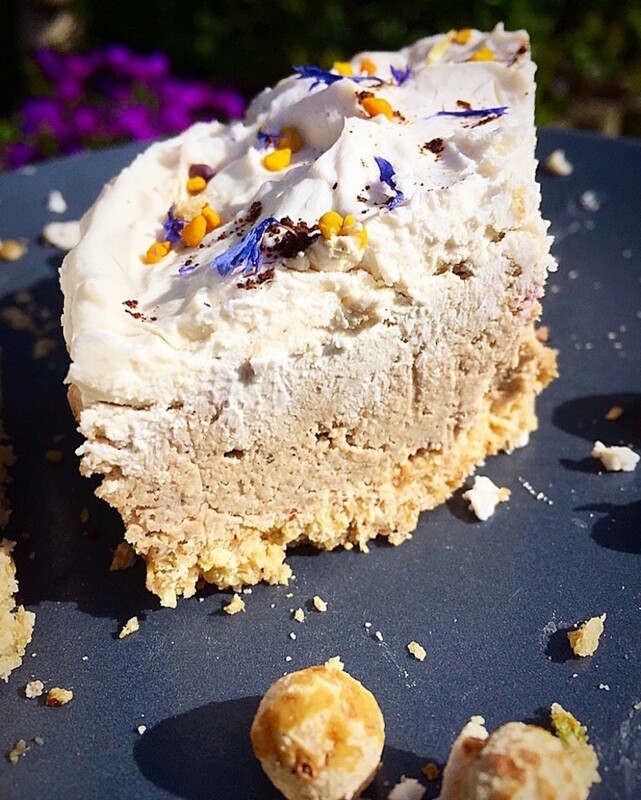 Raw vegan cakes are delicious and nutritious and not just for vegans! They are so easy to make, and once you get the hang of using raw ingredients it is easy to adapt recipes to your own taste and to whatever you have to hand. This recipe is gluten free, dairy free, has no added processed sugar. It is also full of fibre, Omega 9, and vitamin E from tiger nuts , which are also a great source of pre-biotic starch which supports gut health. I love this recipe because it is so easy, so full of nutrition and it looks so pretty. I also love it because the leftover slices (if you have any left over) are a perfect indulgent next day breakfast! Process the tiger nuts and oats (if using) or flour until they look like breadcrumbs. Then add the dates and process until it forms a dough which sticks together when pressed. Press into the bottom of a pie dish, and put in the fridge. Then blend all the ingredients for the filling, until smooth and taste, adjust if necessary. The mixture should look like fudge, if it looks too runny add some extra tiger nut flour to help firm it up a little. Alternatively you could use a little almond flour. Spread evenly over crust, and place back in fridge for a few minutes. Then mix the coconut cream (you can buy the cream in a carton or place two cans of coconut milk in fridge overnight and scoop the top off ). Mix with a little maple syrup and vanilla powder, and spread over the top of the cake. Decorate with anything you like and enjoy!